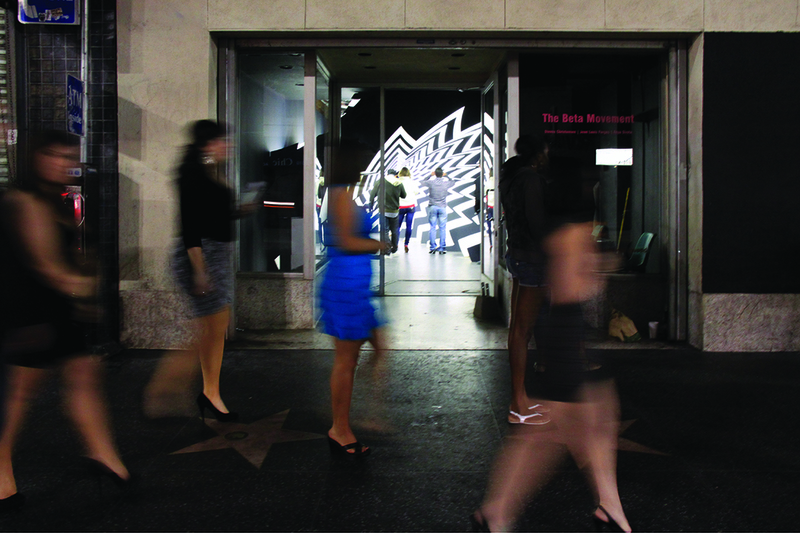 Prominently sited on the Hollywood Walk-of-Fame, The Beta Movement acts as a grand-scale temporary photomaton, inviting tourists and Angelinos inside for their own red carpet moment. Stars are plucked from the famous sidewalk and projected through the gallery, producing a series of spatial distortions that are replete with filmic references to superheroes, hyperspace, hypnotism, evil lairs and astrophysical singularities. Upon entry into the space, the rough qualities of the exposed construction reveal the temporary nature of the illusion. 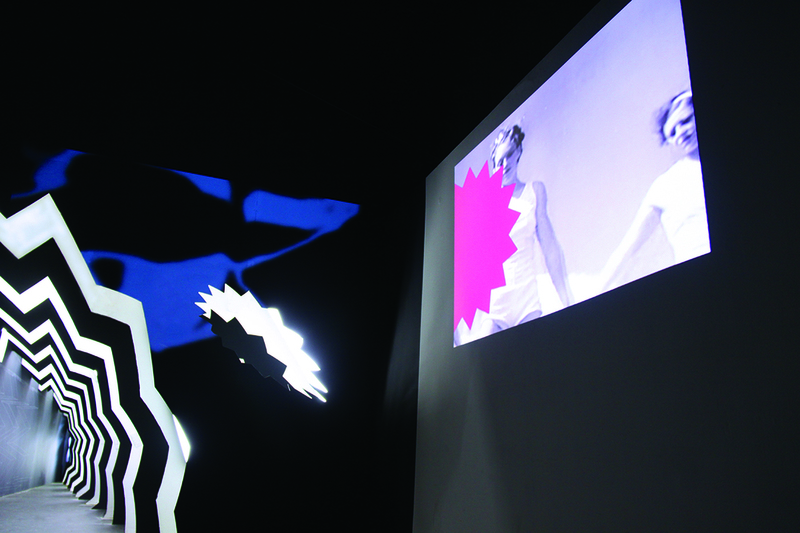 Cutting from one void to the next, visitors make their way to a projection room where video and text describe the formal procedures at play. The Beta Movement targets spatial saturation through minimal moves: a repeating sequence of parallel infill slices and an optical game of perspectival projection. 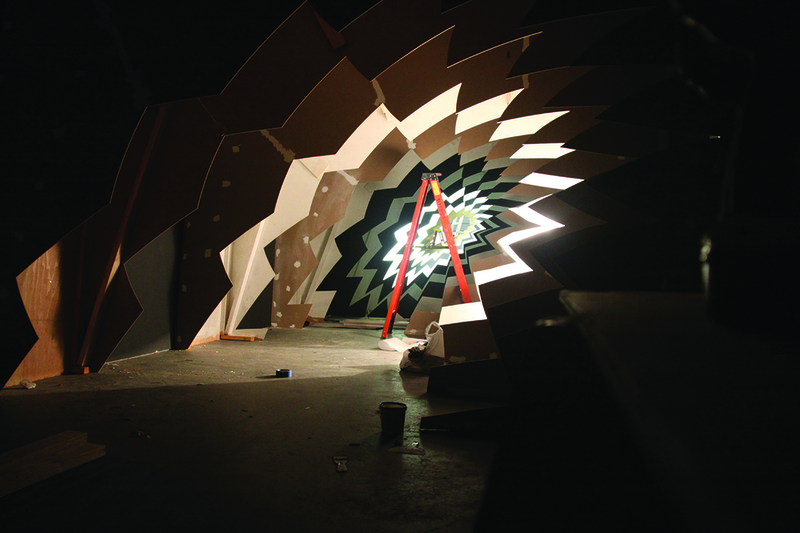 The result is an inhabitable drawing and a series of scenographic frames. Meaning is achieved through duration, occupation, and the filmic pleasure of to-be-looked-at-ness. With the extents of the intervention projected through the depth of the gallery toward infinity, the objectifying gaze is confronted, materialized, and rendered the substance of playful frissons. Starting from a series of privileged points, the perspectival voids frame views and multiply. Inhabiting each frame the occupant is on display, the subject of a tacitly fancied red carpet moment. We all blush at the thought: ’who me, the object of desire?’ But let’s be frank. The subject does on occasion gravitate toward objectification, like the framer who enjoys being framed. 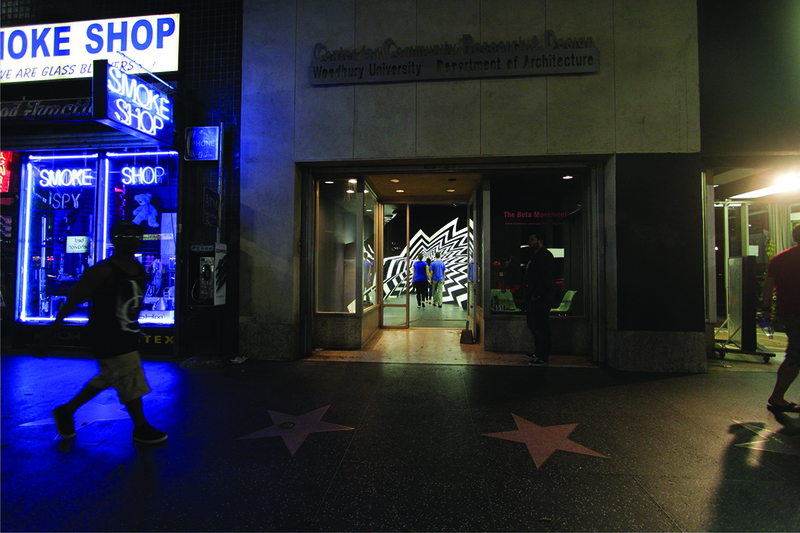 The gallery is located on the Hollywood Walk of Fame. What dizzying excitement! 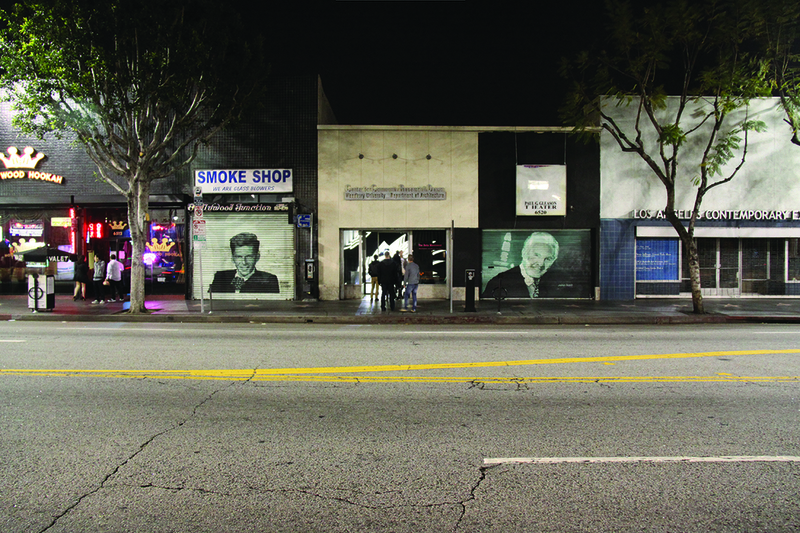 Like the sidewalks, the project revels in its own iconography. Borrowing the star (but pointier and a hint more threatening) we launch its geometry through a series of frames. 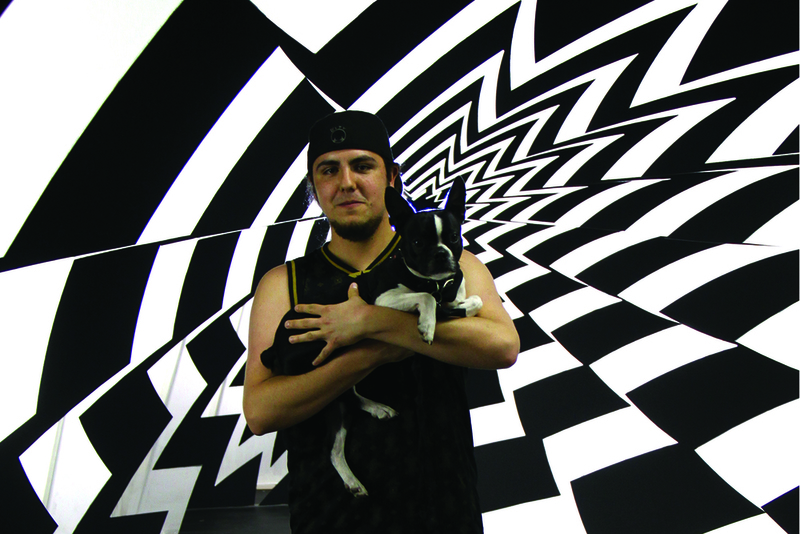 Viewed frontally, the space collapses into a graphic, the familiar “pow” of the comic book superhero; off axis, its depth extends into a villainous hypnotic swirl. But within, you are the star, complicit in a hyper-spatial performance. In this scenario, space is fragmented and the architectural object undermined. In its place — multiple holes, inhabitable memes — in an ode to cheeky contextualism. Snap, you’ve been tagged.